Unfortunately I do not have a green thumb. This year, I was all inspired because we have a balcony and I thought "I hate buying herbs, let's grow our own! I will have pesto up the wazoo and I won't get mad when the grocery store inevitably runs out of basil by 4:55pm." I bought potted plants of parsley, basil and a Venus Fly Trap (for my own amusement). It's now about 4 months later and so far I have used the basil twice (the leaves are tiny), the parsley zero times (I overwatered it) and the V.F.T. has turned brown and I've had to clip off multiple of her little fly-snatchers. 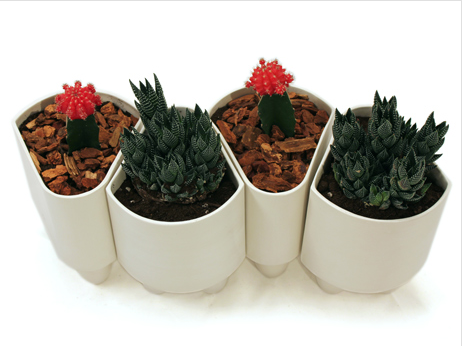 If you have at least one window sill, this little quad might be the answer to stylish potted plants that fit anywhere. Look at how cute they are! Even the little cactus spuds are adorable. Plus, if they are in your kitchen, you probably won't forget to water them like you might when they are outside somewhere. I can't promise that these are magic potters that grow amazing plants, but they certainly are eye catching enough to inspire more care given to happy little house plants.